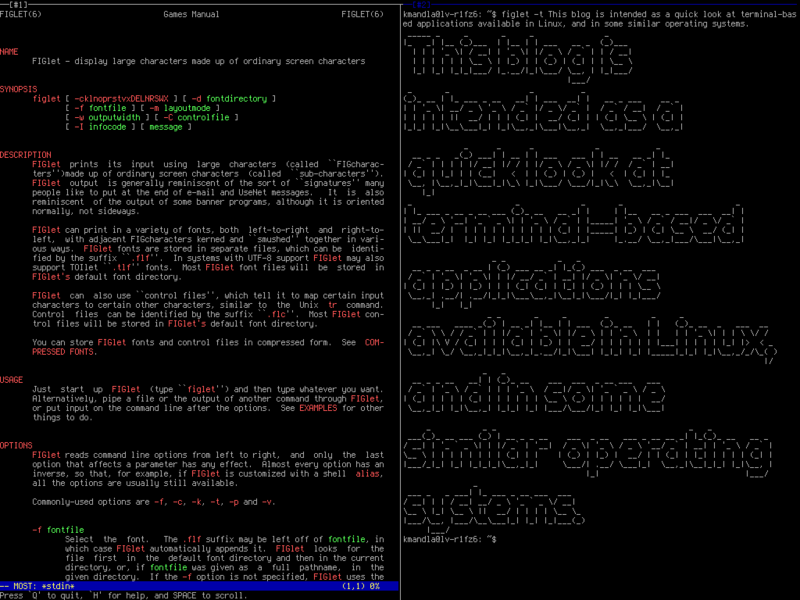 I’ll keep this brief, because figlet is something everyone seems to know about. figlet transforms straight text into large, oversized or decorative letters, suitable for framing. Well, maybe not for framing. Maybe just for sprucing up your output. Or maybe just for fun. I’ve used figlet a lot in the past, but oddly I can’t think of any special gimmicks or tricks right now. Usually it involved piping input from one application through figlet, to use for another purpose. For example, the old mocp screensaver script, or as fodder for cadubi. figlet doesn’t do color that I know of; for that, take a look at toilet, from the makers of libcaca. This entry was posted in Linux and tagged decoration, text on 2013/11/02 by K.Mandla.